Yes, baby number 3! This baby took us completely by surprise....which has just shown us that God's plans are bigger and greater than our plans. 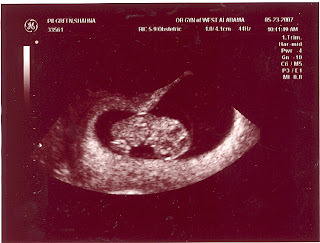 Baby is due on Christmas Day! Shauna is 11 weeks along and feeling nauseous most days, but hoping it will soon pass. Samuel has no understanding and when we told Elijah that the baby is coming in December around Christmas time, his response was, "Again?" I guess he remembers having a little baby brother just in time for Christmas 18 months ago! The picture is of 9 weeks and 2 days. Our God is amazing that He can create such a intricate and precious being.